Create a festive holiday scene with bright and colorful pieces. 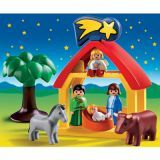 Ideal for toddlers, this set includes four figures, manger with star, horse, cow, and tree. 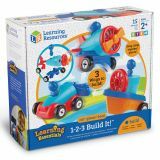 Ages 18+ months. 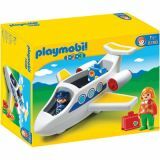 Toddlers on the go can let their imaginations take flight on this personal jet. With space for pilot and one passenger, suitcases fit behind the seat. Ages 1+.